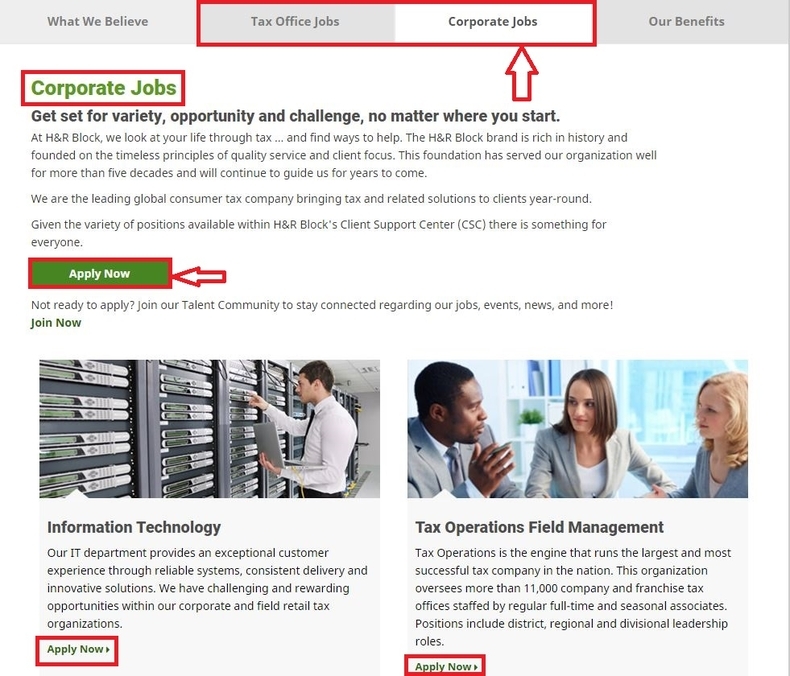 Go to hrblock.com/careers or hrblock//careers to be entered into H&R Block careers page on which you'll see two career areas: Tax Office Jobs and Corporate Jobs. There are different positions under each of the careers area. For example, we choose the Corporate Jobs and click "Apply Now" on the top of the page or under each of the corporate department. Here, we just press "Apply Now" to search specific job titles. In this step, you can choose to search for your next job using the search criteria or advanced search such as job title, job category, keywords and location and then click "Search" to find the positions you are interested in. Or you can just click the job title listed below the featured jobs to continue. 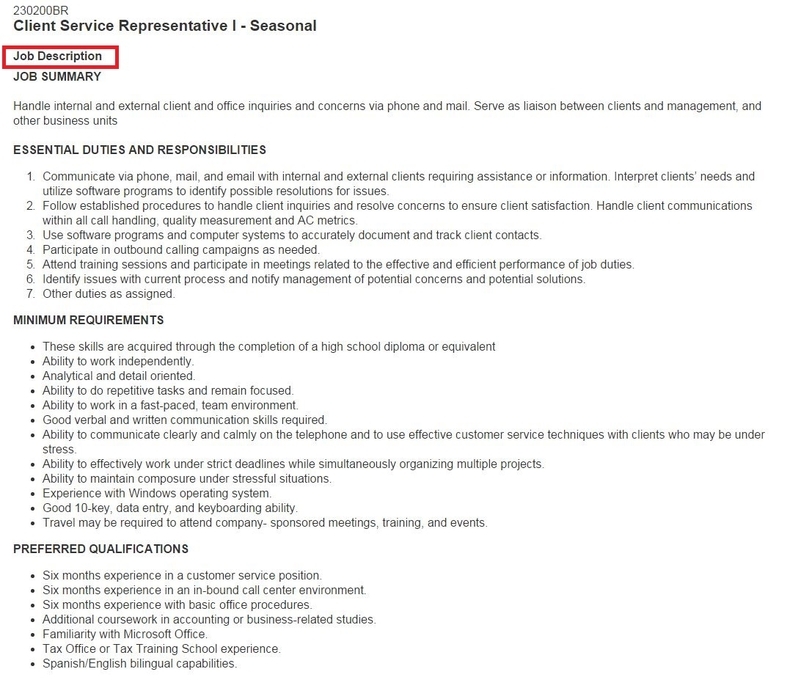 Here we enter "Client Service" as the keywords in the search box to go on with the application process. 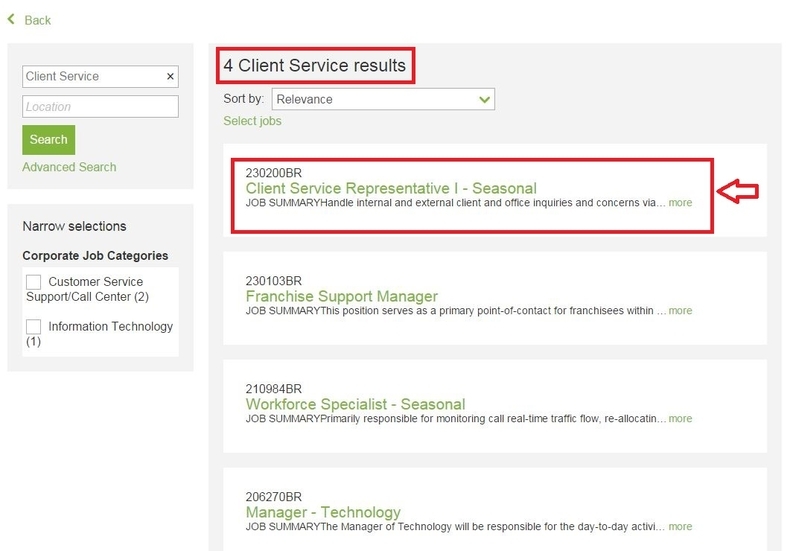 After you input the searching keywords - Client Service in the last step, you'll be directed to the page on which it shows 4 client service results. 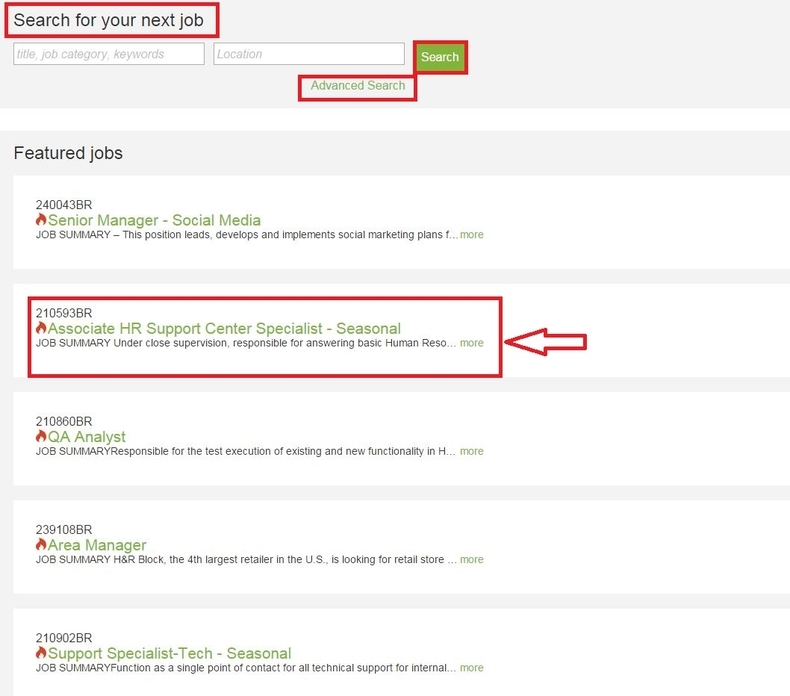 It seems that the first result is most close to your searching keywords, so you can click the job title to go to the next step. Step 4 requires you to read the specific job description including job summary, duties and responsibilities, minimum job requirements, preferred qualifications, etc. 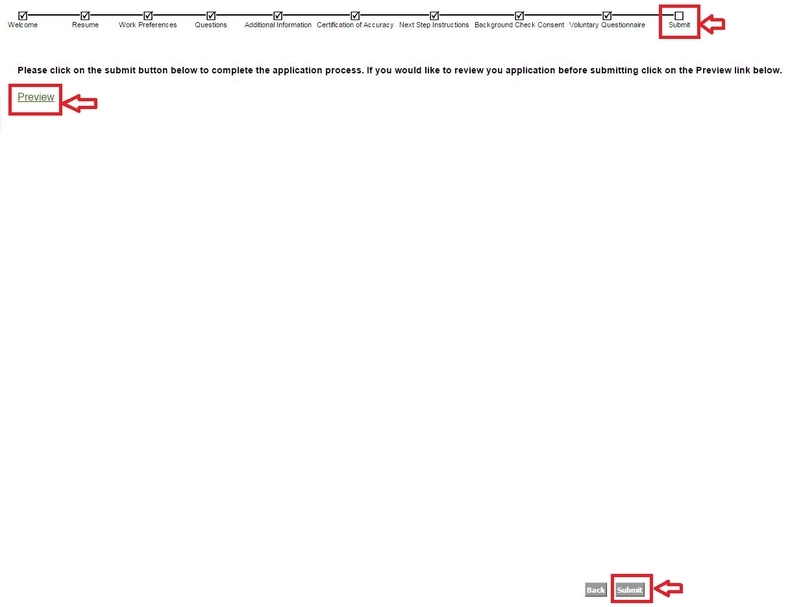 If you are ok with every line of the requirements, just press the "Apply Now" at the bottom of the page. Step 6 is a condensed version of the altogether 8 steps. The entire process will take approximately 20 minutes to complete and will include the submission of several sections, like Employment Application, Certification of Accuracy, Consent to a Background Check, EEO Voluntary Questionnaire and Final Submission. Specific process goes like this: Submit your resume/CV, fill out your contact and education background information, select your availability, finish application questionnaire, complete the Authorization for Background Check and an Equal Opportunity Employer (EEO) Voluntary Questionnaire. After the previous 8 steps, you'll finally get to the submission part. You can preview your final application form by clicking the corresponding links and see if all your info are correctly provided. 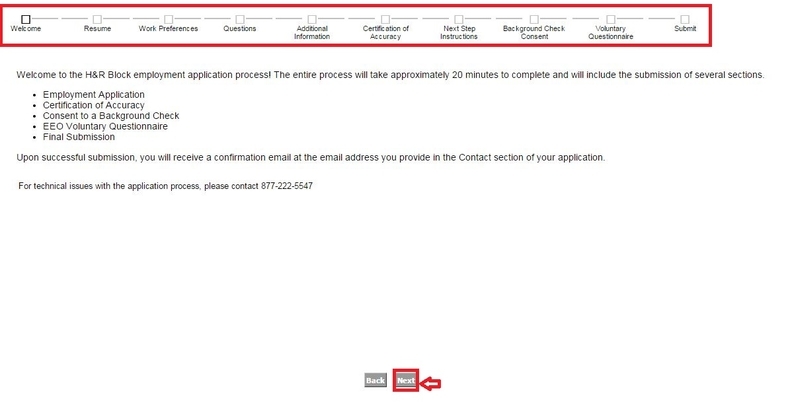 If yes, just press the "Submit" button at the bottom to submit your application. With so much done, you finally come to the page on which you can see the notification that your application has been successfully submitted. 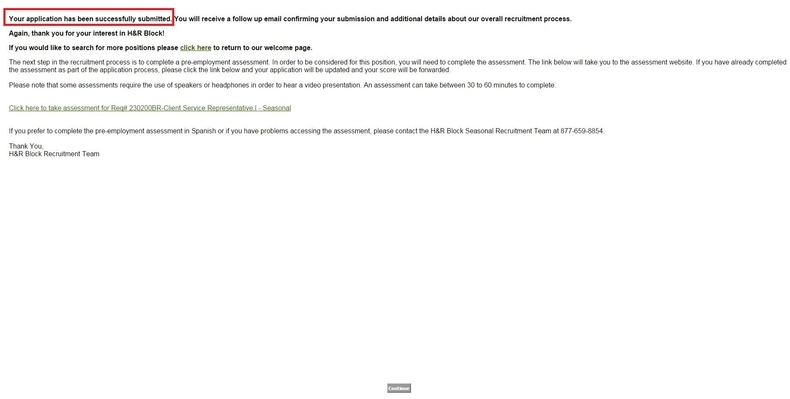 Click hrblock.com/careers to apply for H&R Block jobs online.